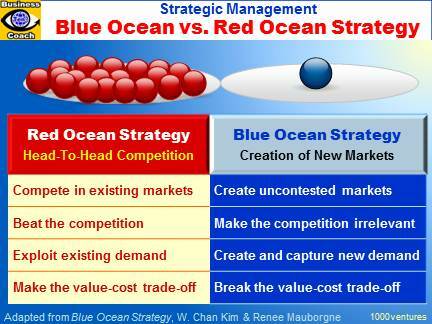 The concept of Blue Ocean Strategy was developed by W. Chan Kim & Renee Mauborgne. Blue Ocean Strategy is about revolutionary value innovation. Value innovation is created in the region where a company’s actions favorably affect both its cost structure and its value proposition to buyers. To define a blue ocean strategy, you should look across alternative industries, look across strategic group within industry, redefine the industry buyer group, look across to complementary product and service offerings, and participate in shaping external trends over time. You need to stand apart in the marketplace. So, your strategy must deviate from me-too-ism, and your value curve must diverge from industry standards.